The Jurassic witnessed a world populated by dinosaurs -- giant plant-eaters munching their way through ferns and conifer forests, while large carnivores chased them down for lunch. At the height of the Age of Dinosaurs, they were found on every continent, flourishing in the warm environments of the time. But, dinosaurs were not always so prominent. Fossil evidence shows that they arose about 230 million years ago during the Triassic period, but remained scarce as other reptiles took center stage. Many mammal forerunners, such as the large plant-eater Placerias, prospered. Huge crocodile-like animals like Smilosuchus were the top predators of the Triassic. Paleontologists who study the fossil record have discovered that something big happened 200 million years ago that radically changed life on land and in the sea, paving the way for dinosaur diversification and prominence. What happened was so momentous that it caused more than half of all life on Earth to go extinct. 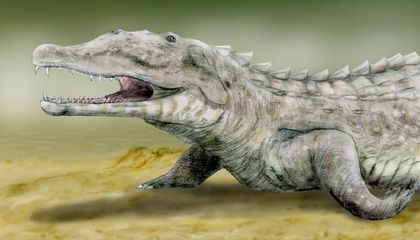 The large crocodile-like reptiles that had dominated the landscape were eradicated, as were many of the mammal forerunners. Find out more about the events that opened the door for the Age of Dinosaurs. Join us on Thursday, October 8, 2015, for a "Smithsonian Science How" live webcast on How Fossils Explain the Rise of Dinosaurs, airing at 11 a.m. and 2 p.m. EDT on the Q?rius website. Paleontologist Dr. Hans Sues from the National Museum of Natural History will appear live to discuss and answer questions. Get teaching resources to support your webcast experience. 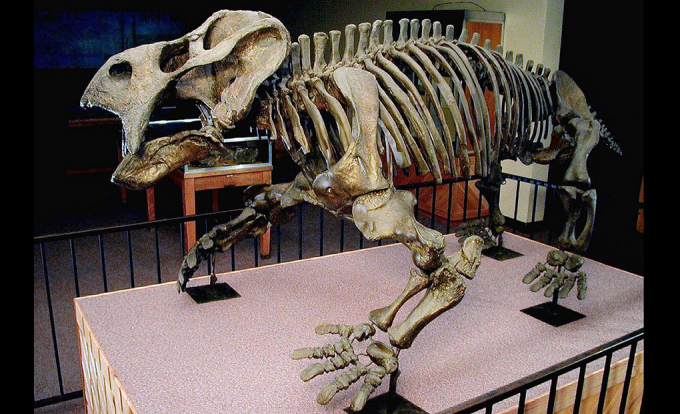 To study dinosaurs, why do scientists rely on fossils instead of photographs? 1. Scientists rely on fossil proof to see what a dinosaur may look like because pictures can be manipulated and drawn up to look nothing like the actual creature. 2. I think that it is amazing how large crocodiles had been eradicated 200 million years ago but ancestors of them can still be found today. 1. Scientist rely on fossils instead of photographs because there was no equipment to take photos with. Fossils can show the approximate age of the dinosaurs. 2. I think it is really cool how scientist can date and tell the species of dinosaurs from million of years ago. It was interesting learning about how before the biggest baddest reptiles in the world the larger crocodile was in the top of the food chain. It gives people a better understanding of the history of the world before the human race. Being in that period would have been terrifying with giant crocodiles running the place. If you want that ever think about living during that period keep running and never look back. Crocodiles and alligators are some of my most favorite animals. The fact that they have been around as long as they have been is pretty cool. I've always loved learning about dinosaurs. The crocodile is very fascinating I didnt know there were crocs back then. This was a great article. 1. To study dinosaurs scientists rely on fossils instead of photographs because when dinosaurs were alive, photographs weren't developed. Fossils also give a clear picture of the actual creature. 2. It's interesting that crocodile-like animals like the Smilosuchus were the top predators of the Triassic. I thought it was the Tyrannosaurus Rex that dominated the Triassic period. 1. Scientist rely on fossils instead of photograph because well humans had yet to evolve to invent the first camera to to a photograph of any of these creatures and fossils are able to tell us large amounts of information about these large reptiles. 2. I feel the article should go more in depth with the large reptiles and mammals of the triassic period describing why they were different from the dinosaurs, any person reading can interpret that the animals were the same as the dinosaurs. 1. Scientists rely on fossils instead of photographs because equipment to take photographs did not exist 230 million years ago during the Triassic period. Fossils are the only record that contains the age and structures of dinosaurs that scientists can analyze. 2. I think it is interesting that there was major extinction during the Triassic period before the age of dinosaurs began and that almost half the life on Earth went extinct. Dinosaurs were the animal that lived 230 million years ago, and these animal were probably the biggest reptile that lived in earth. its nice to know that dinosaurs weren't the main beast back then before they were extinct . GO Alligators! To study dinosaurs scientists rely on fossils instead of photographs because, fossil show more than just that the dinosaurs were alive they show how long ago a dinosaur was alive, possibly where it came from, and what kind of dinosaurs they are as well. For example paragraph three in the article gives a perfect example of why fossil are relied on, they give so much more information, "Fossil evidence shows that they arose about 230 million years ago during the Triassic period." Opinion: I thought this article was very informational and very interesting as well. I also thought it was great how the article included an event that people interested in this topic could go to.